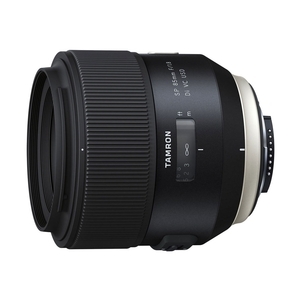 Tamron 85mm f/1.8 SP Di VC USD Lens - Canon Fit. Just as a painter instinctively reaches for the right brush, a portrait artist reaches for an 85mm lens. The focal length is ideal for producing a pleasing image with true-to-life facial features in accurate proportion. While a wide-angle lens makes close objects appear larger than they are, and longer telephotos compress and flatten features, the 85mm medium telephoto is just right. Plus the working distance between you and your subject is perfect for making the personal connection that’s often missing when using a zoom. The Tamron SP 85mm F/1.8 is the world’s first 85mm fast-aperture lens with image stabilization. Its unique design allows us to include our VC (Vibration Compensation) system—without the lens becoming too large or heavy. What’s more, our SP 85mm F/1.8 delivers edge-to-edge viewfinder brightness for ease of composition and superior low-light performance. The fast aperture of the F/1.8 also offers the perfect balance of subject sharpness and bokeh, that dreamy blur which separates your portrait subject from the background. The SP 85mm F/1.8 is the world’s first lens with a fixed focal length of 85mm and a fast aperture of F/1.8 that’s equipped with the VC system. Camera movement—often too minute to be perceptible to the photographer—is the leading cause of unpleasant photographs. In addition, newer DSLR cameras with higher pixel densities are more susceptible to subtle camera shake.